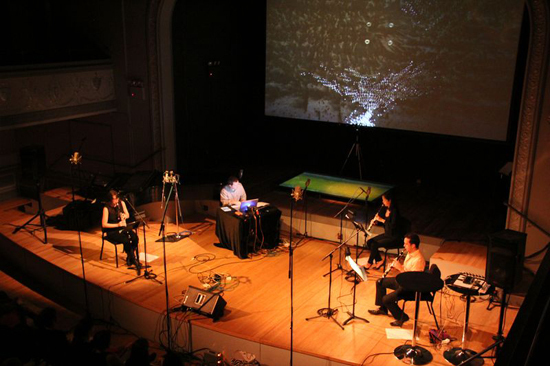 Cloud-to-air examines architectural acoustics through the lens of embodied listening and the memories brought about by the sound of rain. The name of the piece refers to cloud-to-air lightning, where an electrical discharge takes place between a build-up of one type of charge within a cumulonimbus cloud and an opposite charge present in the surrounding atmosphere that never touching the ground. The work consists of a single-channel video of raindrops on a roof projected from above onto a large tray filled with a thin layer of water. 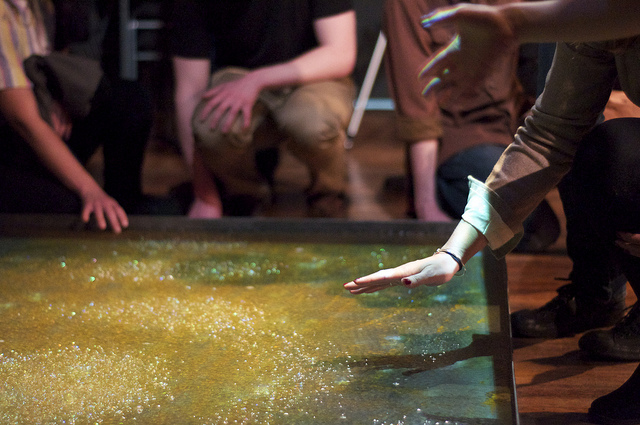 The tray is outfitted with a tactile transducers (a vibrating motor) on the underside whose oscillations cause patterns to appear in the water and small water droplets to break on the surface in counterpoint to the video. The tones that drive the tray, the audible pure tones, and the clarinet score that accompany the rain sounds derive from both acoustical measurements of the performance space as well as analyses of the sound of rain and thunder. An algorithmically-generated weather system controls the spatialization of over fifty recording of rain taken over a single summer. The work aims to highlight shifting experiences of time and memory in the context of a visceral, immersive, but disjointed experience of weather.